Tai didn’t want that wretched jab. Not in the water that purified his synchronized arms and legs – his daily laps in the pool at the elite Bay Club of San Francisco. Tai was on his 20th lap, reaching the cave of unconsciousness not dissimilar to a baby inside its hot tub womb. He was swimming to the canvas– enveloped now in shimmering gold leaf, as each stroke evened out, drawing him into the painting’s details. It invited him; soothed him even. 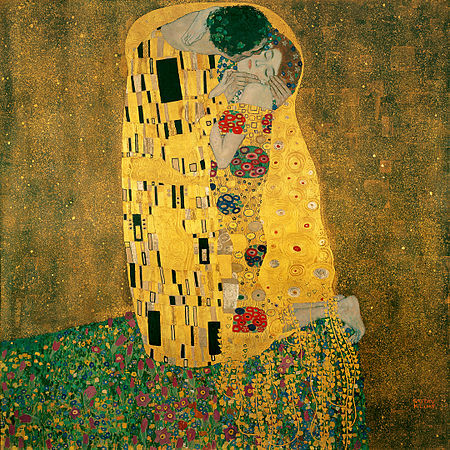 His body waddling inside Klimt’s Der Kuss – his favorite painting. The flatness of his soles launched off the pool’s edges, torpedoing into the kelp grass and spring blossoms that tickled his toes. More colors emerged with eyes closed beneath goggles. Before him, a tapestry of legos: yello spinning cymbals, red, purple and green jellyfishes, onyx rectangles. He wanted to know how these colors were mixed, how Klimt did it? The painting stretching and expanding before him – undulating, quivering. He crawled into her yogurt skin, the woman who kneeled, an act of surrender or absolution. With each stroke, he glided into her mane – untangled, as it was, moving up into her crown of blue, white and green daisies. But that jab. That jab kept getting deeper. Too calculating – too swift, the stroke of seppuku. Over and over again, Tai felt the stabs, leaving him deflated like a kicked dog. And Tai didn’t want to come back from this painting either, oh, no he didn’t - didn’t want to leave this oasis of gold, the woman’s hair, not right as he was turning into the intersection of those rose petal lips. At that moment, when the swimmer begins to claw for surface, arms no longer light as wings, but heavy and loaded with soggy skin, Tai started to lose the automatic rhythm of his breathing. The woman’s mouth opened before him, a sinking black hole of trash and undigested vomit. Jab, jab, jab. Tai stopped midway in the lap lane and clutched his hairless belly. Was he breathing too quickly or not enough? Did he forget to take his TUMs? He could not recover. Tai hoisted his body from the pool, lugged wrinkled toes onto heated marble floors. He tore off the goggles that suctioned around eye sockets, the look of a swollen bee. No time even, to grab an Egyptian cotton towel neatly folded and stacked on the pool benches. He limped clumsily to the men’s locker room, to the closest bathroom stall - any place he could hide and collapse immediately. Once inside a stall, he reminded himself of his breath, slowly counting to 10, the jabbing faded from the stall, from the gym itself and like a spectre gone. Tai sat up, wet with salinated pool water now mingling with sweat, made a seat of the toilet. He placed his hands over his head – laughing, only to hold back tears. Something slid under the door. A tray of something. He studied it like the faces of the homeless who panhandled at the Tenderloin. Curious and repulsed. Something didn’t measure up. It smelled too foul, too sewage-like. Tray in hand, Tai opened the door. Elmer Fudd Dumbfounded. Perhaps the cleaning crew dropped trash meant for dumpster bags? But in front of his stall? And how did it slide right in front his feet? But that tray looked too familiar. Hit too close to home. A part of his past he’d rather nuke forever (he realized the pun later). “Would you like me to take that away for you sir?” a young, greek chiseled Bay Club employee asked him. “Uh, yes. Thanks...” Tai said, realizing on top of it, his unsuitable half nakedness. But it was real. An aluminum tray, 12 by 5 inches: the moldy glop of grey gravy on top of colon clogging mashed potatoes, the vile venom of Salisbury steak, the eraser head nubs of carrot and pea, and that synthetic soil colored cake he used to cherish. His first taste of America – now putrid and void of all life. He ate this meal for 365 days, the sentence to brokeness and bachelordom. From now on until the day of Tai’s reckoning- this tray would appear: in his warehouse loft, behind the forgotten easel and paintbrush coffee can, wedged into post office box, graffiti-ed onto the windshield of his vintage ’72 BMer – stalking Tai, beseeching Tai, hearkening Tai. Back. A message only Tai could decipher. But Tai had no idea what it all meant and why it was there – that decomposing TV dinner served perfectly cold.